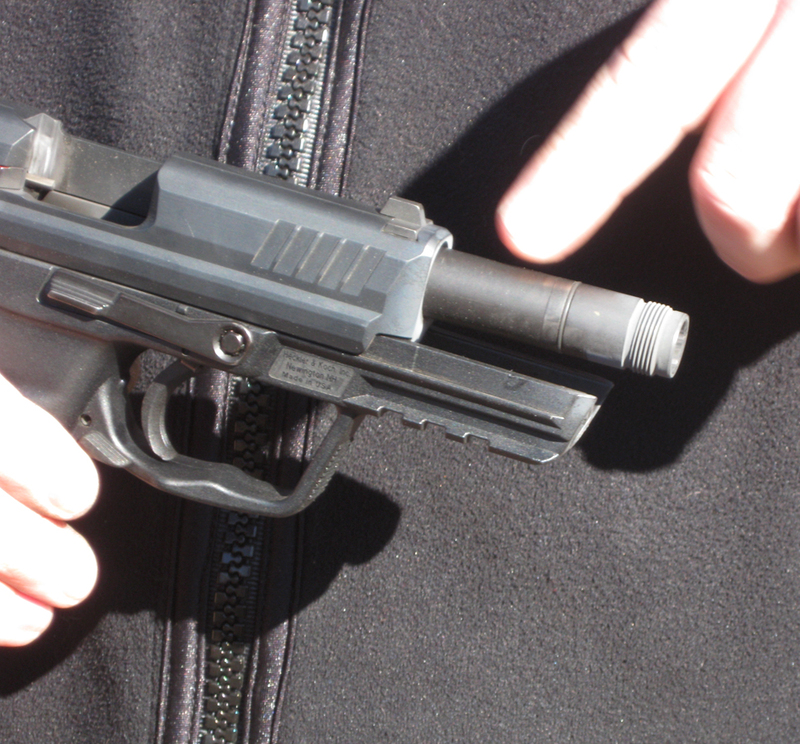 Heckler and Koch’s Jeff Swisher was kind enough to walk us through the features of their new HK45 Compact Tactical (CT) pistol at Media Day at the Range, SHOT Show 2012. 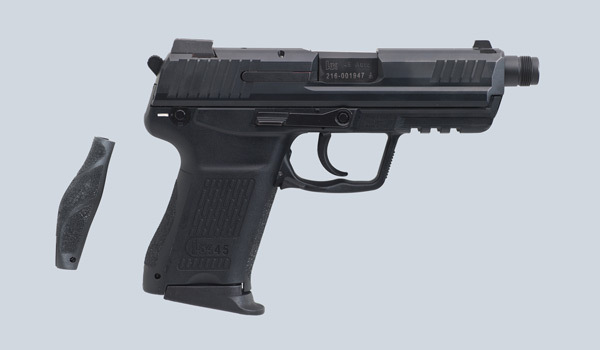 This new variant of the HK45 series is a recoil operated pistol with a modified Browning locking system. The action is either DA/SA or their Law Enforcement Modification DAO. 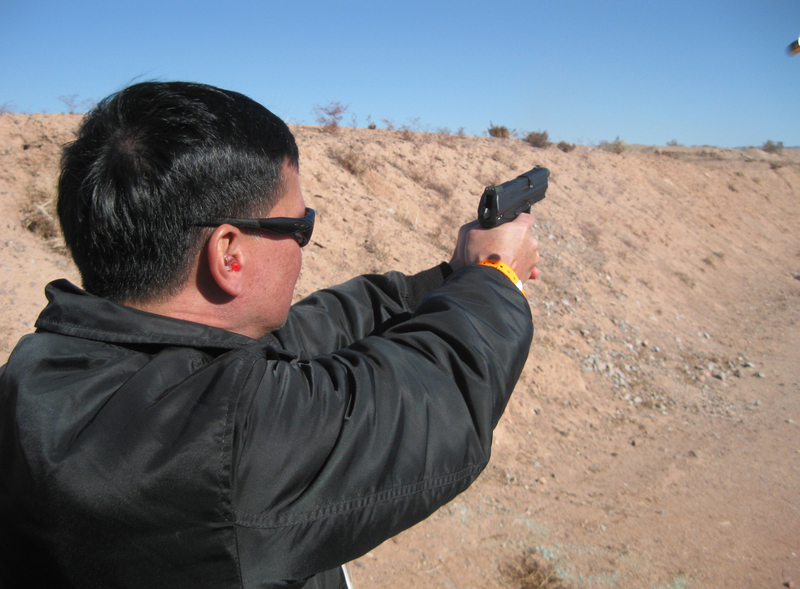 The HK45CT was derived from the HK45 series to give civilians a taste of the Special Operations pistol made for the now-defunct U.S. Military Joint Combat Pistol and Combat Pistol programs from several years ago. This gun has a threaded barrel, replaceable grip panels, a 10 round extended magazine, ambidextrous slide and mag release, and standard night sights. It accepts all HK45 magazines. 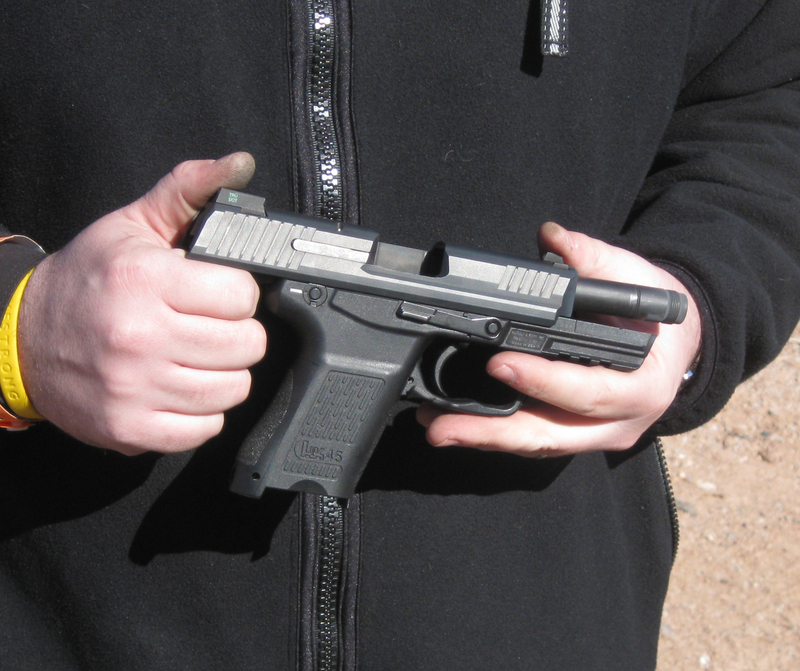 H&K says their HK45CT’s o-ring system gives better barrel to slide lock-up for increased accuracy. I was lucky enough to get some trigger time with the HK45CT at Heckler and Koch’s range display. The target I had down range was a bad guy/hostage steel headshot plate, where the knockdown portion was about one half of the BG’s head. Shooting at about 12 yards, I was able to consistently send my foe to his maker. The pistol weighs about 29 ounces unloaded. This heft and the gun’s design were just right for keeping the muzzle controlled during recoil. In the photo below you can see the .45 ACP casing at the top right of the image and I am pretty much coming back down on target. This was during slow, deliberate fire when I was trying to punch the BG in the T-zone. I shot a rapid fire string from one mag that showcased the pistol’s good manners while it hammered away at a torso-sized plate, all bullets striking COM. 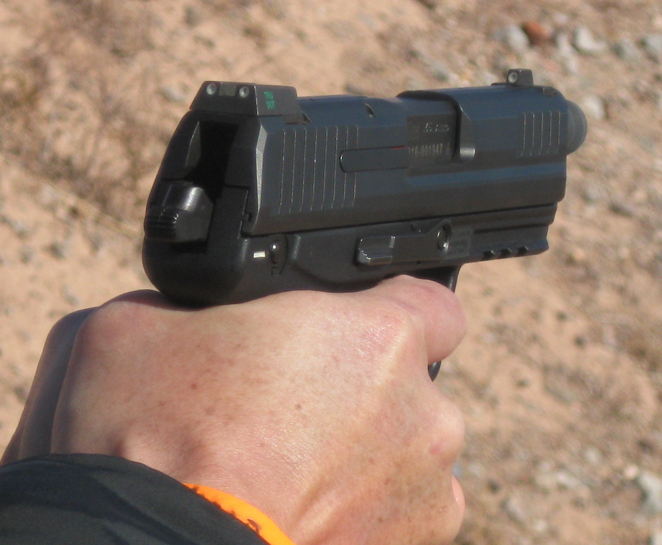 Ergonomically, the pistol fit my hand well and I enjoyed shooting it very much. Again, it was a range gun that had lots of rounds through it before I showed up. As expected, it functioned without protest. I’ll just go ahead and say it. 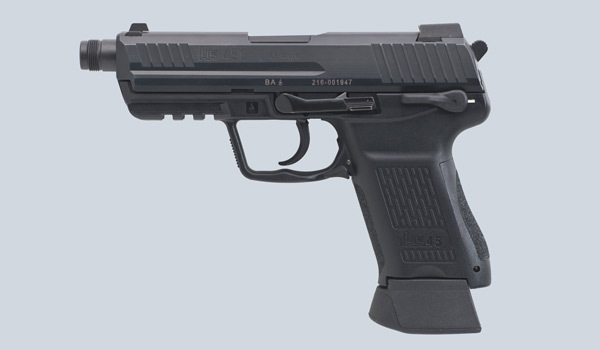 This pistol is great for the H&K fan-boy (or girl). It is pricey at about $1200.00 to $1400.00. I personally don’t need the threaded suppressor fitting, but it does look cool and gives the barrel 1/2″ more length. If you like the Special Operations appearance of the pistol and Heckler and Koch’s storied history of providing CQB firearms, then you may find this quality handgun some space in your safe. This entry was posted in Firearms, SHOT Show and tagged H & K, Heckler and Koch, Heckler and Kock Review, HK45 Compact Tactical, HK45CT, Joint Combat Pistol Program, Special Operations. Bookmark the permalink. Hopefully H & K supplies thread protector with the (HK45CT) tactical barrels?